Here in our garden, during late September, we have many plants blooming including Mexican Sunflower (tithonia), Watermelon, Peanuts, Japanese Anemones, Thai Dragon Peppers, Cleomes, Cannas, Strawflower, Purple Aster, Blue Mink Ageratum, Porcelain Berry, Beauty Berry, Pineapple (because why not? ), Zinnas and Marigolds. Everything is growing so nicely. All the different colors are so pleasing to the eye. Mexican Sunflower blooms on seven foot tall plants. 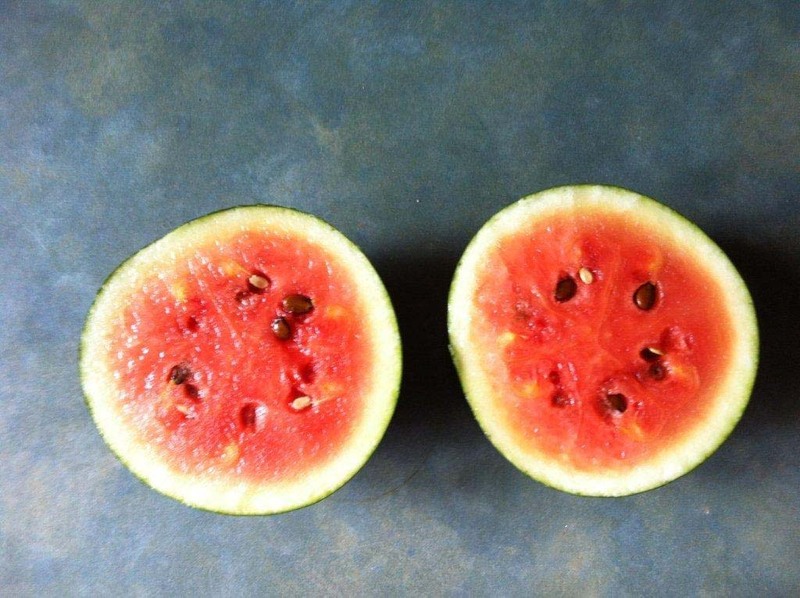 Tiny Watermelons are perfectly round about 4-5 inches across. Bob thinks he is the only one in Suffolk County growing peanuts. There are four pots. Japanese Anenomes about 3 feet tall. Flowers are about 2-3 inches across. Thai Dragon peppers are about finger sized. Not sure how hot they are but I think i'm going to make some salsa with them. In front of the potting shed. Cleomes bloom behind the Cannas. Pots of straw flower in the foreground. Purple asters bloom among the cleomes. They're perennials. Blue Mink Ageratum blooms in a big sweep. This is a porcelain berry vine shoved into a tomato cage. It has berries that are a pale blue like delft porcelain. Berries range from pale bluish-green to deep purple. Beauty Berry named for obvious reasons. Sprays of tiny bright purple berries appear as the leaves turn to a brighter chartreuse. Bob is growing a pineapple. About 18 months ago, he cut the top off of a pineapple from the grocery store. It has been just a green spiky plant up until about 3 months ago. The pineapple fruit is about the size of a small plum. It is curently on the porch but will be coming in soon. I'll keep you posted. Zinnias and Marigolds blooming in the cutting garden. Smells great and are nice and juicy. They are the perfect single size serving! Posted in Our Garden, September Blooms, What's in Bloom and tagged Gardening, Gardens, LI, LI Gardening, Long Island, Our Garden, September 27, VanDyke, VanDyke Gardens, VD Gardens, Whats growing.